Late fall days in Churchill are an idyllic time to inspire young minds with the magic of the frozen tundra. What kid (let alone a parent) could resist an Arctic family adventure that sends you out dog sledding, up in a helicopter over the tundra, roving around in search of winter-adapted wildlife, and onto an ice rink to try curling? Just imagine the wondrous wide eyes at these delights! Turning up the fun, we’ve created an itinerary that amps up our cultural interactions with Churchill locals who live year-round in this historic town that was once a fur-trading post. A slate of wintry activities keeps all generations engaged while placing meaningful encounters with wildlife and the fragile tundra ecosystem within the grasp of young naturalists. Bundle up for an exciting experience in nature that promises to take your breath away—and maybe even inspire the next generation of Arctic conservationists. Churchill is the "Accessible Arctic"
Located just below the Arctic Circle, Churchill is technically subarctic, but as winter ice creeps across Hudson Bay to affect regional weather, the vast tundra is enveloped by seasonal chill, and the landscape and climate have a distinctly Arctic feel. Inaccessible by road, Churchill is remote and isolated, but its wonders are within easy reach via direct flight from Winnipeg, Manitoba’s capital. To simplify access, we charter our own private aircraft from Winnipeg to Churchill, maximizing our time up north. This makes for an easy-to-reach Arctic family trip, convenient with kids in tow. Our family-focused trip is an opportunity you won't find anywhere else to experience the magic of the Arctic! By tailoring our activities to maximize action and engagement on Arctic terrain, we're confident kids of all ages will experience wonder and amazement as they explore the tundra ecosystem. And we're confident that time spent looking for and learning about polar bears and other Arctic wildlife will help inspire the Arctic's future conservationists, too. Natural Habitat Adventures is famous for hiring the top guides in the industry. Our Arctic Expedition Leaders receive additional training and resources from WWF’s top scientists, ensuring the best nature interpretive experience available. Expedition Leaders meet your family in Winnipeg and travel with you the entire way, sharing a wealth of knowledge and insight at every turn. And those assigned to guide this trip are known for their special rapport with kids. See Expedition Leader bios with traveler comments regarding the quality of our leaders—you'll find none better! An experience in nature should be intimate. We limit our groups to approximately 16 guests so everyone has plenty of space to spread out, angle for photos, ask questions, play with the sled dogs, talk to our Expedition Leader, and engage personally with all we encounter on the tundra. Get out onto the tundra aboard our Polar Rover, a giant vehicle custom-designed for searching for wildlife on this rugged terrain. Operating exclusively in Churchill, our Polar Rover is the most comfortable tundra vehicle available. It's toasty warm inside, with plenty of wiggle room for your family and a window seat for all. On-board flush toilets facilitate your comfort during a full day on the move. An advanced suspension system smooths the bumpy ride while the innovative drive train lets us traverse the tundra with virtually no chance of breaking down. See more details on our Polar Rovers. Just two tour operators in Churchill hold permits to access the full range of the Churchill Wildlife Management Area where the best wildlife viewing occurs. Naturally, in our commitment to running the world’s greatest nature journeys, the Natural Habitat/Great White Bear team possesses one of these permits (as well as the best vehicles). This wild zone along the edge of Hudson Bay is home to Arctic fox, Arctic hare, snowy owl and other hardy northern wildlife. Of course, we search out polar bears and, depending on when the ice forms, may see them from our private Polar Rovers or from the air. To experience the magnitude and tranquility of it all, you need our exclusive access. Natural Habitat Adventures offers an exclusive guarantee, clearly stating that we will meet the lofty expectations we set in our promotional materials. To our knowledge, this is the most ambitious guarantee made by any adventure travel company. Read our important promise. We all care about the planet, and on this adventure, you can travel knowing that the emissions from your trip are 100-percent carbon-offset. Natural Habitat Adventures is the world’s first carbon-neutral travel company, a feature that is particularly important when considering that polar bears and other Arctic wildlife face a substantial threat from a warming planet. Because of our commitment to environmentally friendly travel, as well as the exceptional quality of our adventures, World Wildlife Fund, the world's leading environmental conservation organization, has named Natural Habitat as its worldwide travel partner, a designation that makes us exceedingly proud! 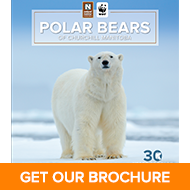 Fill out the form below to receive additional information about our Churchill Arctic Family Adventure. Hi Nat Hab, I’m interested in your Churchill Arctic Family Adventure. Can you please contact me with more information?